TARGET3001! design station is an object-oriented, 32-bit schematic- simulation- and printed circuit board development system for the PC. It’s a partly automatic tool, that assists you with the drawing of a schematic, the mixed-mode simulation of a circuit and the PCB design with an integrated EMC checking tool. The data of the schematic, simulation, PCB and EMC check are collected and editable in one file. Any changes in one of the program parts will automatically update the remaining view involved in the data file. A inconsistent data basis is therefore prohibited and a complicated translation or communication via netlists is inapplicable. TARGET3001! design station is the only software system worldwide with the mentioned features in combination with one common user interface. 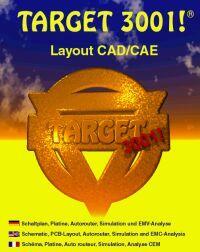 TARGET 3001 is a full featured PCB design software which was designed to let you help in your work with circuit board projects. TARGET3001! design station has extendable symbol-, model- and package libraries and is capable of creating a bill of material (B.O.M) as well as netlists in several formats. Components can not only be placed by hand or automatically, they can also be edited at any time. You can route your PCB’s on the screen interactively and/or fully automatically. The finished PCB file can be translated to several data formats with the help of special output drivers, allowing you to create data which can be used for a selection of different CAM processes. · Schematic, simulation, PCB and EMC-analysis data in one file (no version conflicts!). · All functions active reduced to projects with up to 250 Pins/Pads on two copper layers. · Simulation capable of 30 signals. · Board size is up to 1,860 square inches (=1.44 square meters). This download is marked as adware because it displays advertisement banners or other type of commercials while running.